A quick getaway with bebe and Foray Collective. A couple weeks ago, I was able to escape for a dreamy Palm Springs getaway hosted by Foray Collective and bebe. @blankitinerary @pamhetlinger @walkinwonderland @sophieelkus were there too which was great. PS has always been a favored impromptu destination of mine, and I love getting to know new girls from the industry—especially when they are extremely cool and smart. We stayed at the Korakia Pensione which felt like a Moroccan paradise and had cute, intimate bungalow cottages. 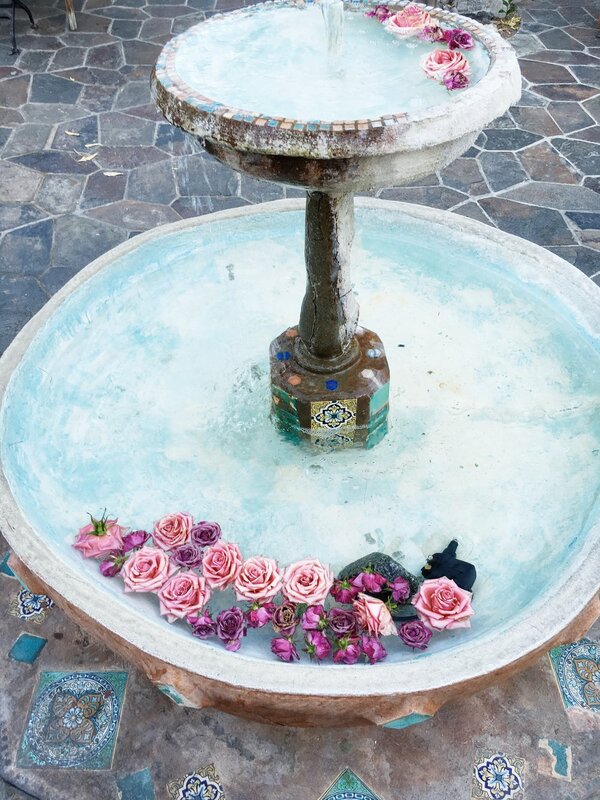 The whole space was unique and gorgeous—even the hotel’s fountain had rose petals floating in it. Everything was sooo peaceful and quiet. Since I manage Influencer Marketing at Foray, I actually coordinated the trip and luckily it turned out really well! Day one I wore my favorite bebe outfit of the weekend, this off-the-shoulder black top. We relaxed at the pool all day and followed that up with in-room massages. Heaven! Happy hour was spent sipping champagne in the hotel’s courtyard where I finally got to meet (the super sweet) Pam and Sheryl. After HH, we headed to Workshop for a three-hour communal dinner with endless laughs...and drinks. Post dinner all the girls headed back to the pool for a night swim + more wine. So much fun! Before leaving the next day, we attended the bebe brunch at the courtyard and had the BEST avocado toast (even better than what I’ve had in LA). It was farm-to-table food and you could really taste the freshness. I could do this weekend over and over again. ‘Til next time, Palm Springs!